I love language. I love listening to people talk and noting the way that different people say different words. I love accents and colloquialisms (and I spelled that right on the first try!). I also love being from Pittsburgh, because we’ve got one of the more talked about accents/vocabularies. 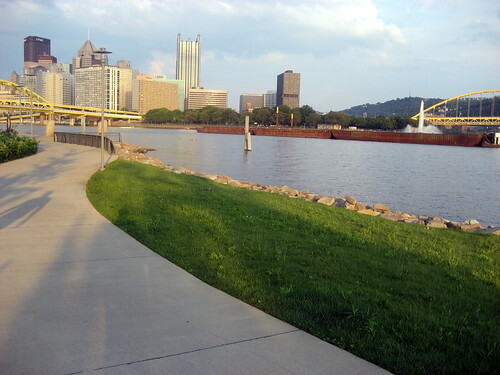 I’ve spent a fair amount of time with people outside the city/state due to my time at Pitt and due to my frequent internetting, and one of my favorite topics is that of Pittsburghese. While I adore Pittsburghese and am pleased to hear the accent in full force, I don’t really use much of it myself. I grew up outside of the city and though I know what all of the words mean and how to use them, they just aren’t a part of my vocabulary. But I’ve noticed over the years that I have quite the lazy accent myself. (Sadly, sometimes only after it is pointed out to me.) “Up there” and “down there” do not exist in my world. It’s “Upere” and “Downere.” “Going to” has morphed into some very unattractive one-syllable word that I couldn’t spell if I tried. Not only do I find myself combining words, I also drop words entirely. Never do I ask “What time is it?” “Time is it?” does just as well as long as you ask in an inquisitive manner. All told, I believe I am a rather intelligent person, but I feel like sometimes I give the wrong impression based on my speech. My vocabulary is pretty decent though, so maybe I occasionally make up for it by wowing people with some fancy words. It probably wouldn’t be hard to make a conscious effort to improve my speech, but like my accent, I am lazy, so ‘sthe point?